Sliabh Liag (Slieve Leage), the highest accessible seacliffs in Europe reaching a height of 1,972 feet/601 meters, is almost twice as high as the Eiffel Tower in Paris and nearly three times the height of the more famous Cliffs of Moher in County Clare. 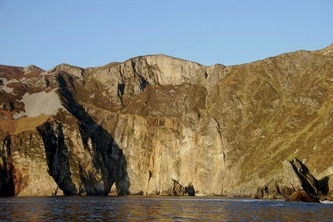 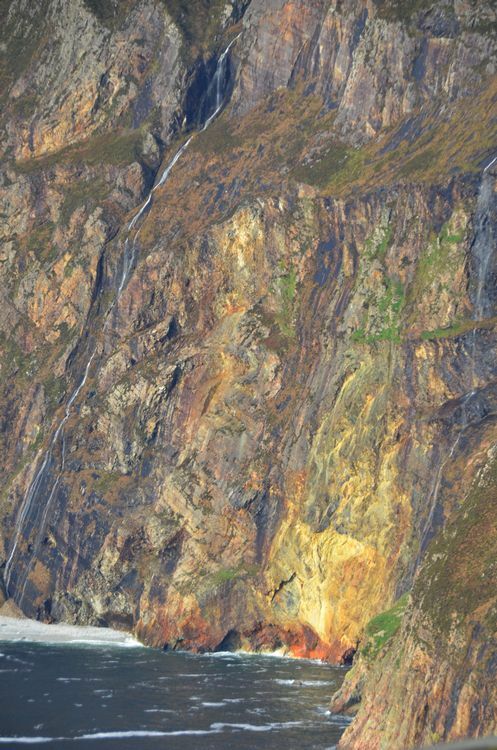 It is often reported that Sliabh Liag are the highest sea cliffs in Europe but this is a fallacy. They are actually the fifth highest in Europe after: Cape Enniberg, The Faroe Islands 754m; Croaghun, Achill Island, County Mayo, Ireland 688m; Vixia Herbeira, Spain 621m and Preikestolen, Norway 604m, and second highest in Ireland and Britain. 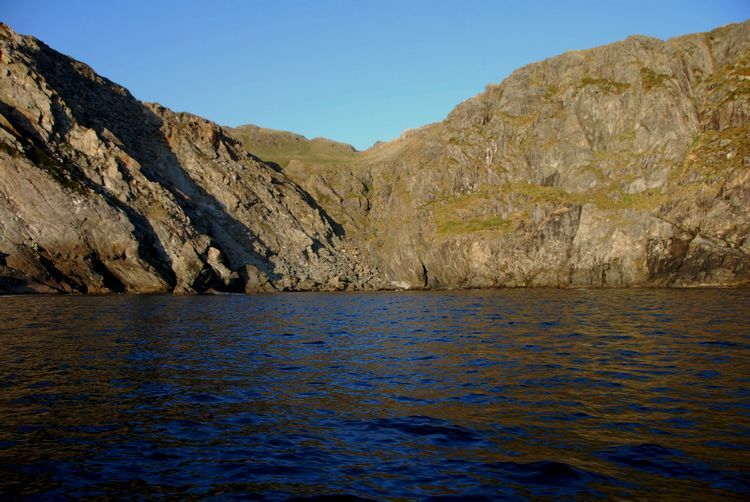 The most important difference however is that Sliabh Liag is easily accessible whereas some of the others are either inaccessible or only accessible by trained hikers or mountain climbers. It is now possible to drive almost to the very highest point as much work has been carried out at the cliffs in recent years. At the top there is now a carpark and a large viewing platform. 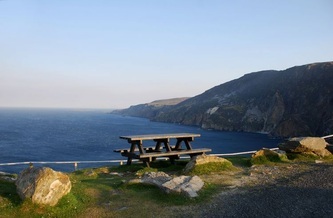 There are also benches to sit and enjoy the views and picnic tables to perhaps enjoy a picnic whilst taking in the scenery. 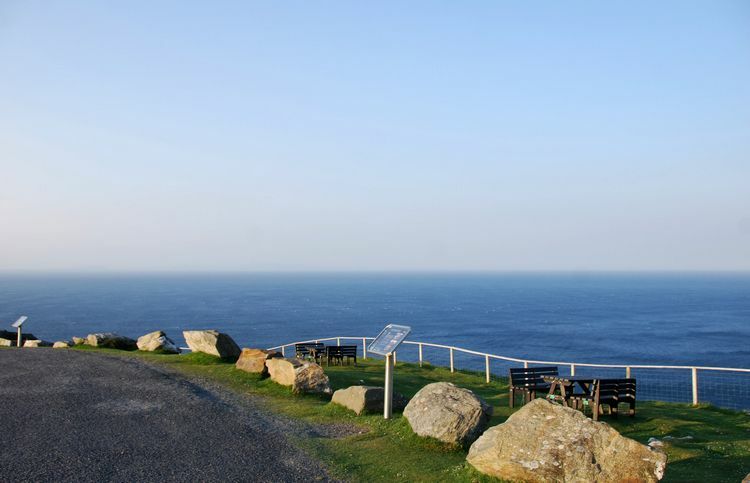 From the top you can look out across Donegal Bay all the way to County Sligo and beyond. 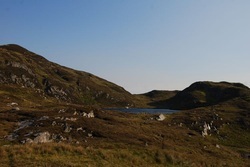 There are a number of lakes on the way to the sumit, and at the base there is a small beach of pure white sand. 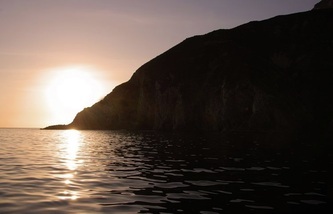 The beach is only approachable by boat. 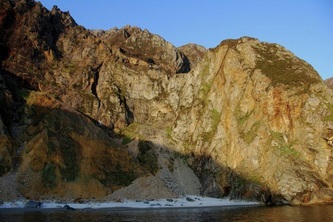 To the right hand side of the beach there is a fairly large cave where seals sometimes take time out of the water to shade themselves at the edge of the cave or sun themselves on the beach. 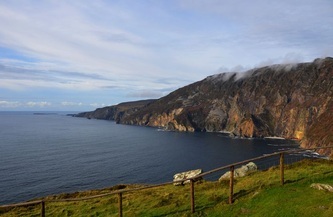 Fog can land quickly on Sliabh Liag so care should be taken at all times. 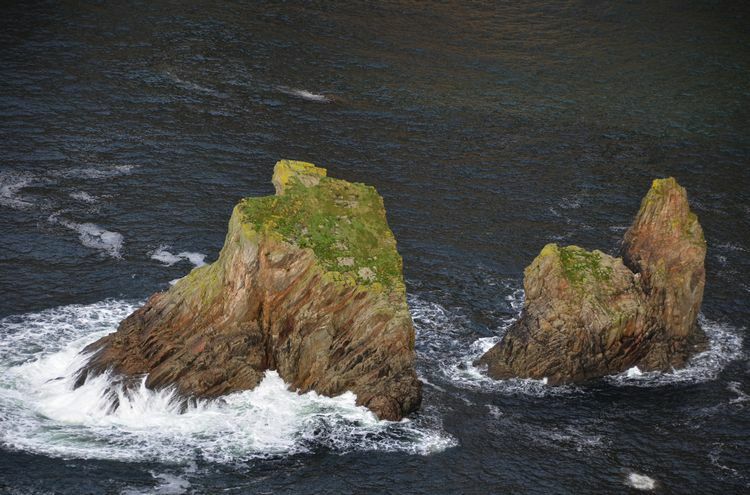 If you get into any difficulty the emergency numbers to ring are 999 or 112. 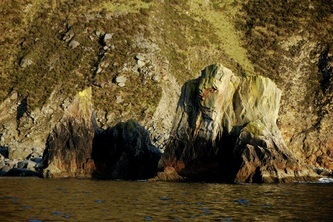 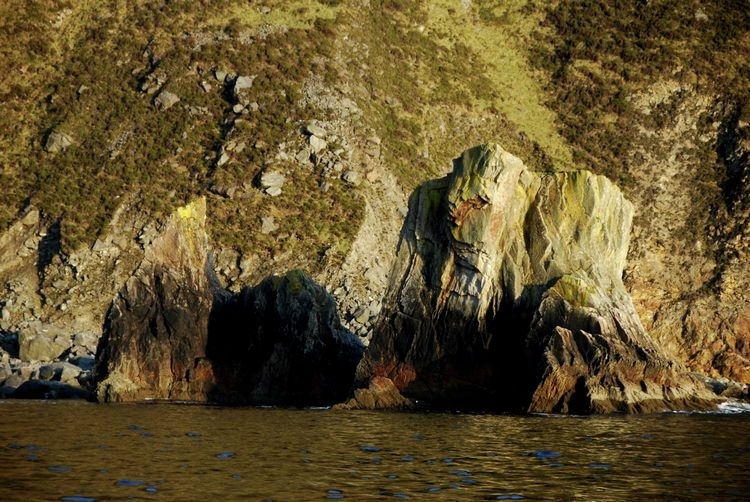 You can take boat trips around the cliffs from nearby Teelin on the Nuala Star. 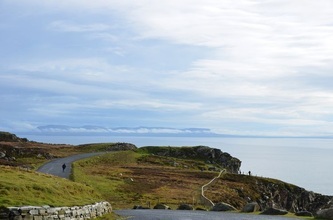 Scroll down for more information, photographs and a google map. 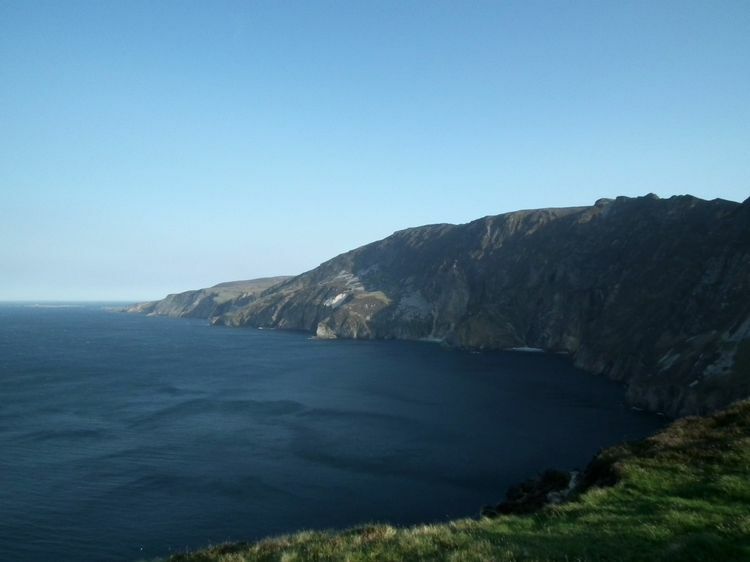 Once at the car park at the top of Sliabh Liag you can walk even higher to the highest point of the cliffs using the Pilgrims Path. However, this should only be undertaken by those with the correct walking equipment and boots (and with a strong head for heights!). 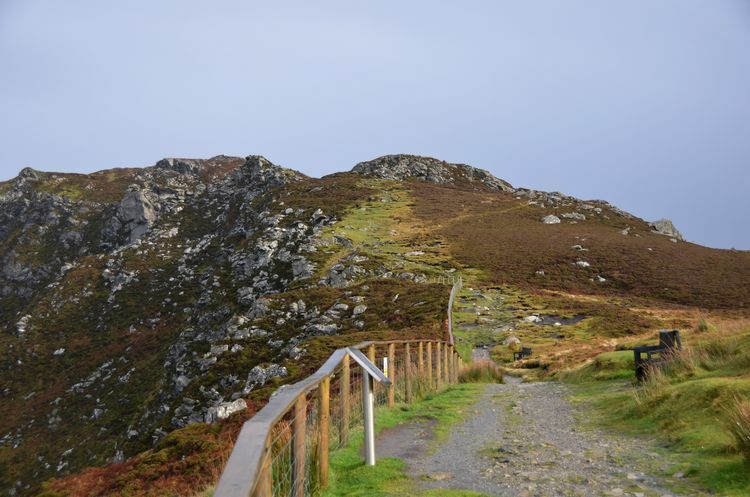 It should never be attempted if there is any hint of fog or low clouds and children and dogs should never be taken up this path. 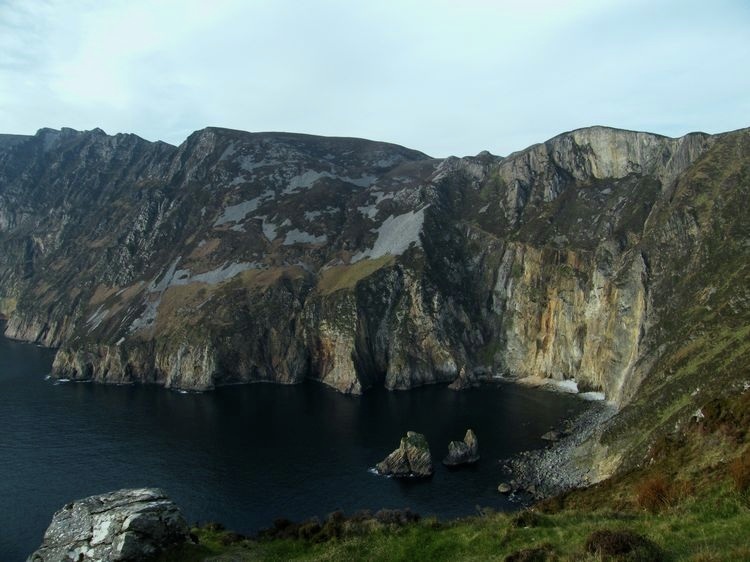 "The Pilgrim Path is an alternative route for hill walkers to the summit of Sliabh Liag. 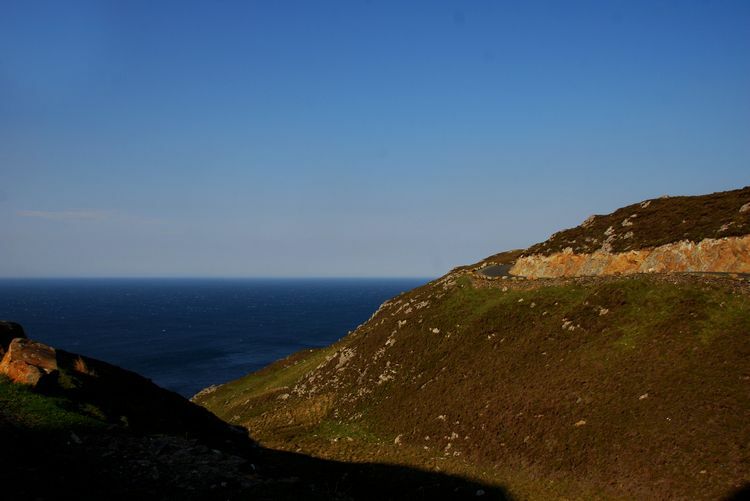 The traditional path along the cliff tops is suffering considerable damage from walkers and a programme of repair and restoration works is being undertaken. In order to minimise further damage whilst this work is underway you are asked to consider using the Pilgrim Path as a route to access and return from the summit. However, it is unmarked and should only be attempted by suitably equipped and experienced walkers. 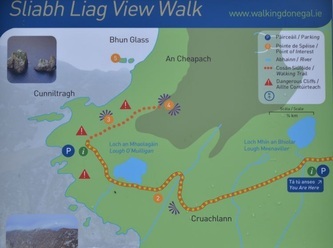 Please Note: no dogs allowed on this route." Standing at the viewing point, look down into the sea below and you will see two rock formations which look very like a huge desk and chair, these are called "The Giant's Desk and Chair". The photograph to the left here is zoomed in ~ they look tiny from the cliffs! 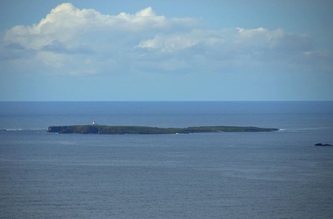 Looking out from the cliffs you can see a small island and this is Rathlin O'Birne island. In the fifth centuary there was a Monastery on the island although little is know of it. 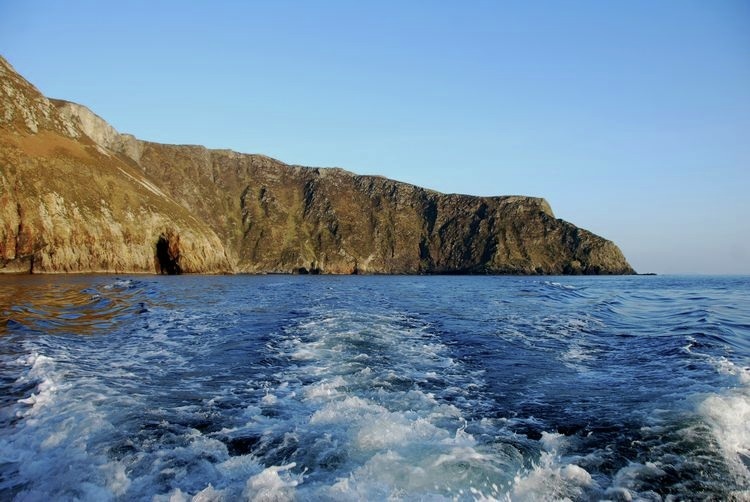 St. Asicus who was the first Bishop of Elphin (appointed by St. Patrick to whom he was coppersmith too), became a hermit and travelled to Sliabh Liag on on to Rathlin Island where he remained for seven years. In more recent times the lighthouse on the island (established in 1856) which in 1974 turned to nuclear power and at that time was one of the most powerful lighthouse in the world. Today it is solar powered. 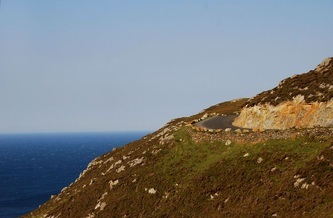 Donegal Lighthouses. 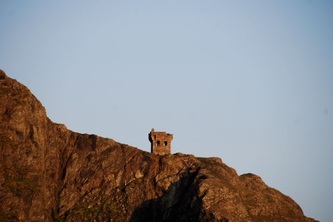 Near the top of Sliabh Liag, at Carrigan Head, you can see one of twelve Napoleonic Towers once dotted around the coast of County Donegal. They were built from the start of the 19th century by British forces (Ireland was still under British rule then) as lookouts against the French during the Napoleonic wars. 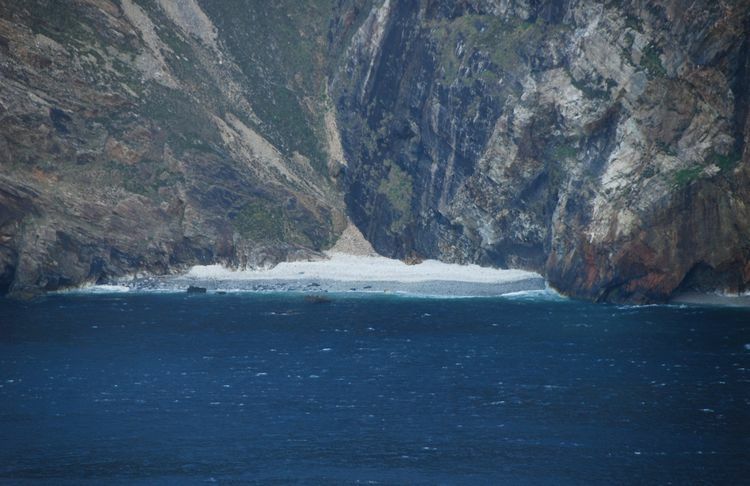 They were manned by a naval force called the "Sea Fencibles". 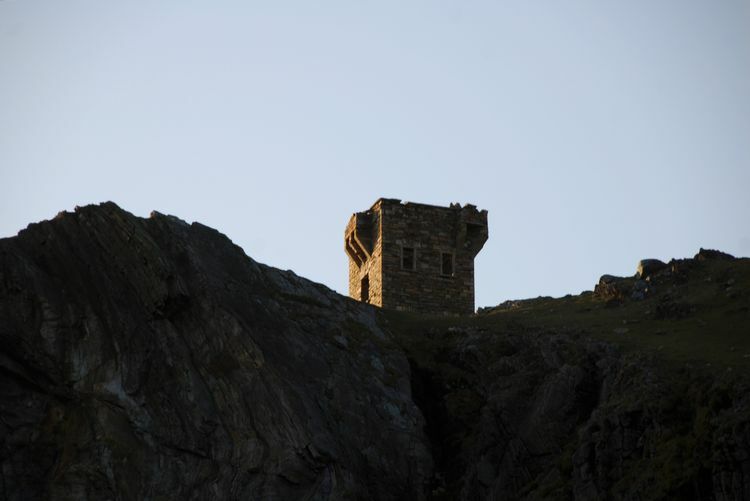 From each tower these forces would have been able to see the two other towers nearest to them and so on so that each tower was connected for communication (probably by semaphore). 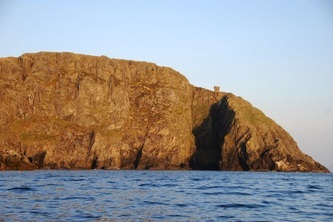 If you look toward Rathlin Island from the cliffs you can just see another Napoleonic Tower which is at Malinbeg. 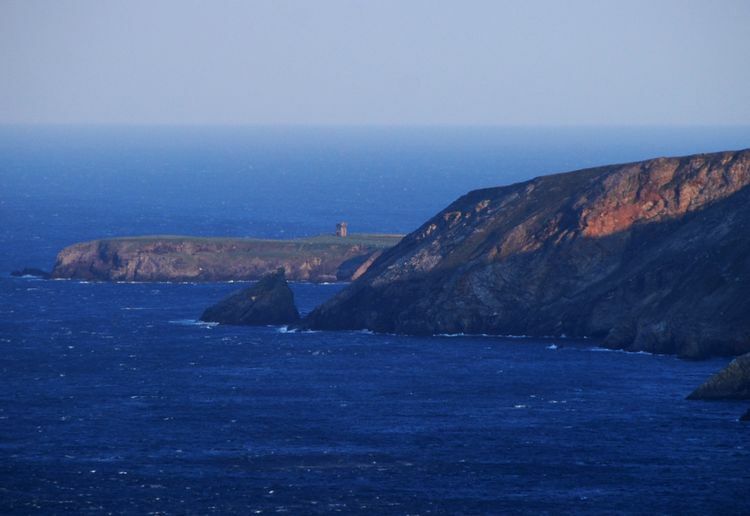 There would have been another at St. John's Point which was probably where the lighthouse there is now and you can see the St. John's Point lighthouse from Sliabh Liag. 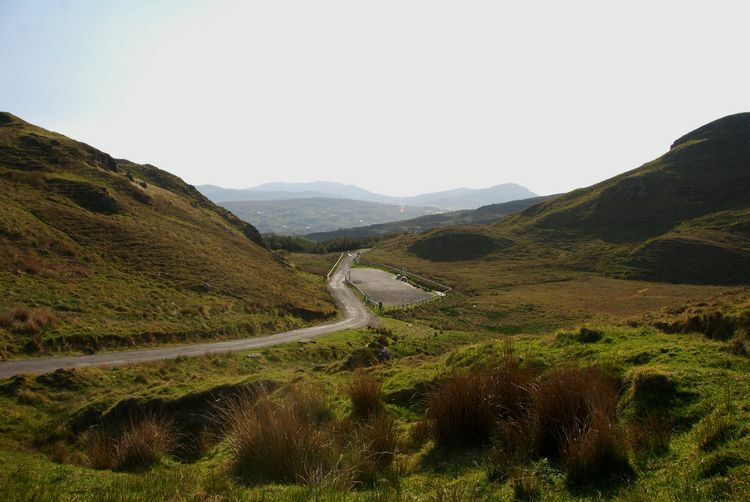 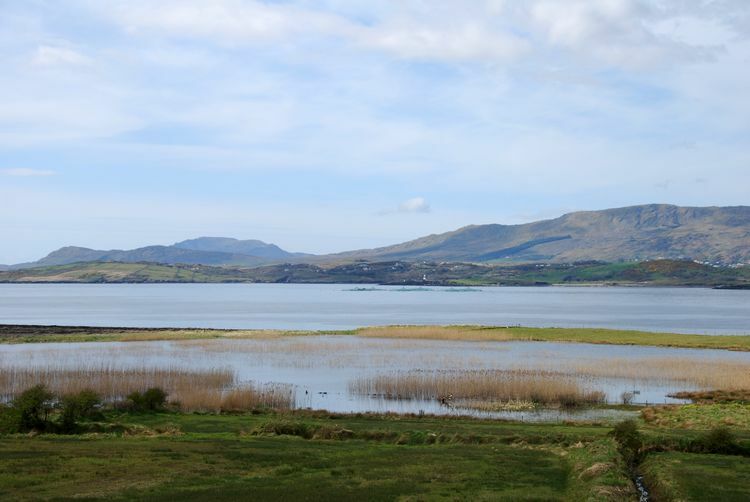 There are a number of loughs (or lakes) at Sliabh Liag including Lough Croleavy, Lough Meenaviller and Lough O'Mulligan (which can be seen from the road up to the cliffs). 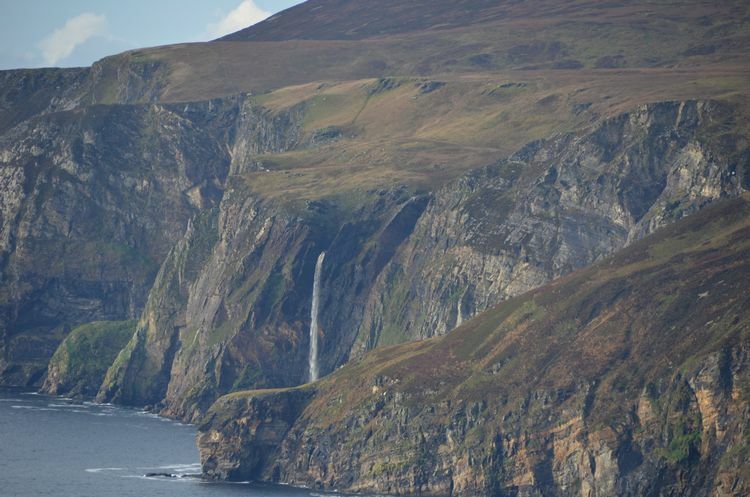 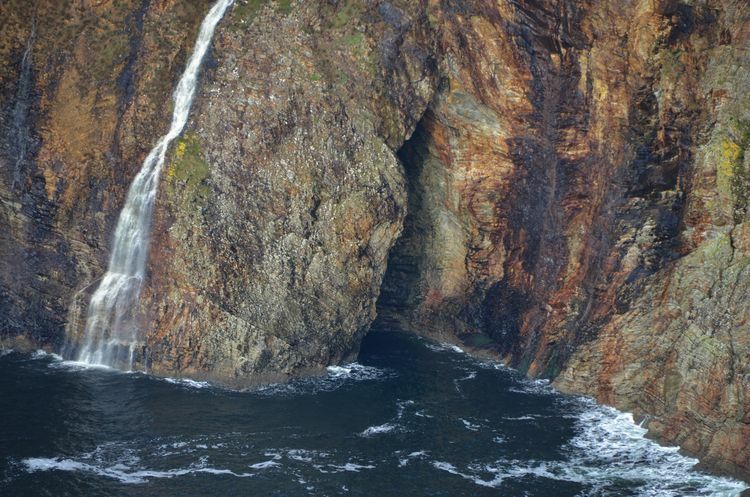 If you stand at the viewing point at Sliabh Liag and look across to the cliffs to your right (and look carefully) you will see many small waterfalls cascading down the cliffs to the sea below. 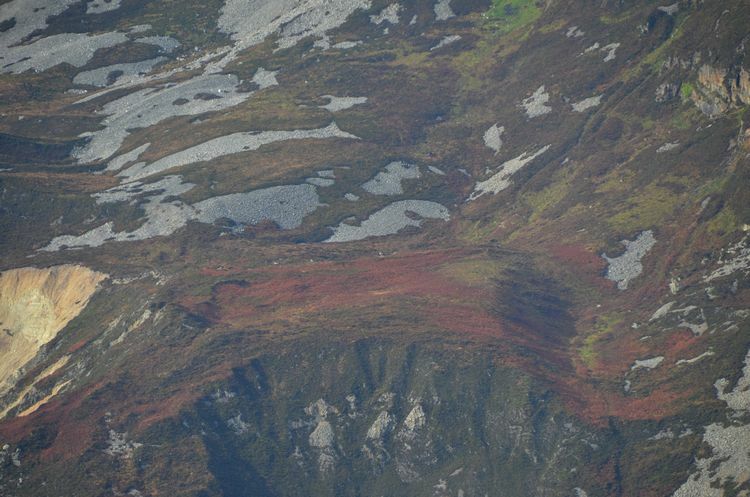 If there has been heavy rain for any period they are more noticeable and more impressive but look closely even during dry weather and you will spot them. 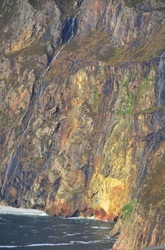 Look closely too (or use binoculars or the zoom on your camera) and you will spot many caves dotted along the base of the cliffs opposite the viewing point. 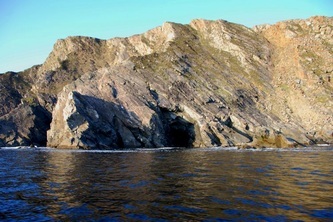 From a boat you can see many more caves all around the cliffs. Although many don't realise it, you can actually drive all the way to the top of Sliabh Liag. The road is very narrow with lay-byes every so often to allow oncoming cars to pass each other and at parts it is extrememly near to the edge. 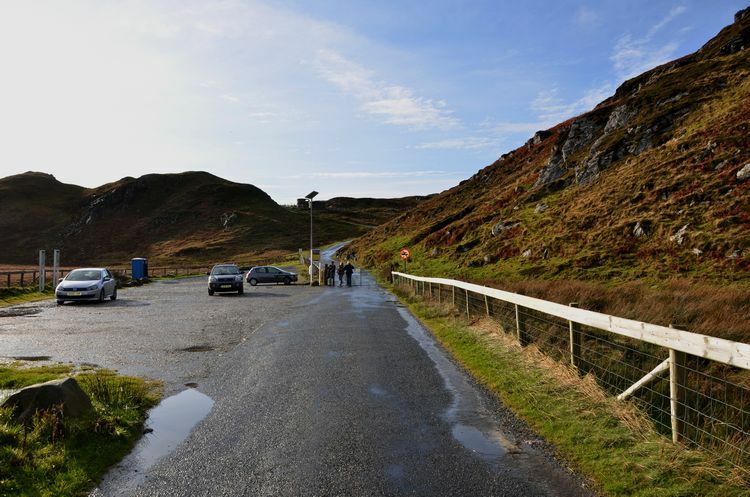 Obviously the drive up should never be attempted in the winter months or even outside those months when there is a danger of ice. 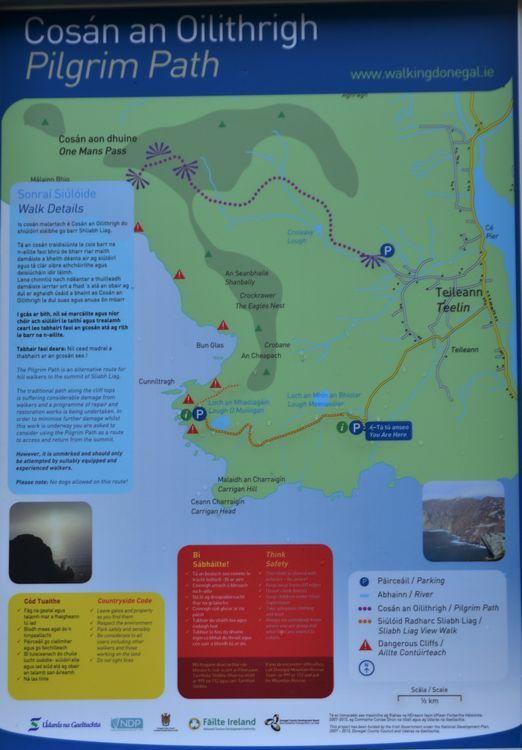 All that said, it is not too difficult to drive up for those who don't fancy the 1 and a half kilometer walk up, just take care. Even if you are going to walk up you need to at all times be aware that there is traffic (even buses) on the road so just pay attention at all times. 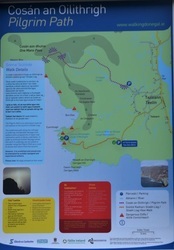 The walk up is fairly even with only the first half kilometer or so being steep, the remainder being of a lesser incline. Both car parks are free of charge and there is a port-a-loo in the first car park. 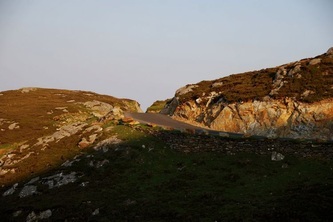 If driving up leave the gate as found, ie. 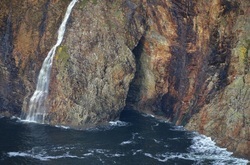 if closed, close it after yourself, if open, leave it open.